While we may have been too irreverent then for some people, I was in truth an Apolinario Mabini fan. I love reading Philippine history. I have a strong affinity for the turn-of-the-century (1900s) Filipinos who fought the war of independence against Spain, and later the Americans. I find many of our heroes quite interesting and remarkable. They were flawed human beings but did their heroic best during their time. Jose Rizal, Andres Bonifacio, Macario Sakay, Emilio Jacinto, the Luna brothers were some of them. But I have always kept a special place in my heart for Apolinario Mabini. APO started with the name Apolinario Mabini Hiking Society which we used in our first real gig in an inter-school competition. It was a surefire way to solicit a double-take from the audience then. We were being cheeky and ironic. We were also defying the norm of the times when most groups had American-sounding names. He was an intellectual of the highest order. And his heart throughout the struggle was always in the right place. While many failed the test of patriotism under tremendous pressure, he felt deeply for his country and remained true and loyal to his principles. I remember reading Mabini’s True Decalogue for the first time in high school. I was floored. It was a call and a guide to being a good citizen of the republic he had dreamed and fought for. It was a call to serve God, country, and our fellow human beings with love and integrity. It called for freedom, egalitarianism, reason and the virtue of work. It was also a call against establishing a monarchy which bred dynasties — a form of governance he was particularly against. What a magnificent work, I thought. A little over 19 years ago, I wanted to write a pop song that embodied my personal code of ethics which I wanted to pass on to APO’s audience. I must admit I was inspired by Mabini’s work. However, I wanted something less ambitious in scope and breadth. I wrote something much simpler. I ended up making a recitation of do’s and don’ts that people can practice in everyday life. It’s a song about how to build character. APO did record it. You can find it on YouTube and Spotify. It is on APO’s “Mismo” album. It is a lively, danceable song. The title is Tanggapin mo, Tanggihan mo. I hope you have time to actually listen to it online. I would like to share the lyrics with you here. Nang malaman ang sariling kiliti. It was my personal decalogo then. I still believe in it but I would probably add more verses now. I made this at a time when an election was looming. I wanted people to get serious and think deeply about the values and character they would like to see in their leaders, and hopefully in themselves. It is election season once again. It is time to assess the character of those we choose to lead us. My APO buddy Boboy Garrovillo and I did a show last week. It was a fun gig at the Pinoy Playlist Festival 2018 in BGC where 100 artists performed during the last two weekends. It was an eclectic mix of acts. 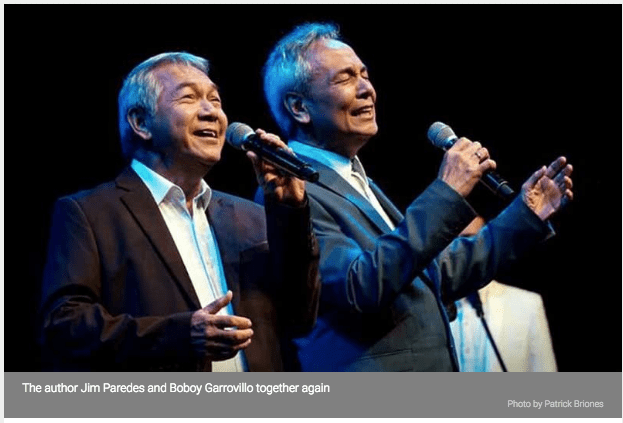 Artists as varied as Ryan Cayabyab Singers, Noel Cabangon, Nicole Asensio, Glock 9, Razorback, The Company, Shanti Dope, Sandwich, Ben and Ben, Davey Langit, Rachelle Gerodias, and a lot of new and seasoned artists showed up and participated. The shows happened simultaneously in three venues. Two were at the Maybank Theater building, and one was in a big tent nearby. Each artist’s performance ran 45 minutes long. With a one-day ticket, you could watch many scheduled artists performing in one day. Or you could get a pass for the entire two weekends. It is impossible to watch all of them since the shows in the different venues happened at the same time. You had to choose whom to watch. Boboy and I were very excited to do this. It is a unique festival for artists out to showcase their talents and artistry. And it was in its initial year. For veterans like us, we said yes because it would be a good way to sing to a new, younger audience. All songs performed were to be OPM. Our slot was at 9 p.m. Oct. 11 at the Maybank Main Theater where the APO musical ran its first season last August to September. I arrived three days early from a vacation in Sydney so we could rehearse with our two backup singers, Kay and Anthony of the Ryan Cayabyab Singers. We made a repertoire of our own hits with the aim to entertain everyone. After all, the audience was a mix of young and old, GenX and millennials, long-time fans, and first-time watchers. We started the show with a hit song made by Louie Ocampo for the 2nd Metro Pop Festival in the ‘80s. We were his interpreters then. We won second place. The song Ewan came out to be more popular than the first placer which was Bulag, Pipi, Bingi sung by Freddie Aguilar. The audience loved Ewan. Immediately, we felt a connection. When we asked the audience how many were watching us perform live for the first time, quite a sizable number raised their hands. I was elated. It is always great to reach out to a new audience. It was quite funny for Boboy and I as we observed how the young people were reacting to our show. We have done countless shows in the past and can almost always predict when a noticeable audience reaction would happen. The audience at Maybank that night applauded not just in the moments we knew they would but also during some unexpected ones. During the show, Boboy and I would once in a while burst into song and dance and do synchronized movements. When we did , we would see the smiles on the audience’s faces as they expressed a collective ‘‘wow’’ while clapping. They probably found our few choreographed numbers quite novel and charming. They even applauded them. The right word to describe their reaction to our act was they found it “quaint.” Maybe because of our age, they did not expect us to do them. But when I think about it, not too many young performers these days do much in terms of unison movements or even choreography during songs. Bands basically just stand there and maybe do the usual head banging while playing something fast and loud. They mostly do not put effort into doing footwork or body movements. Since our songs are quite well known, they always elicit positive reaction from the audience. We made sure we performed the big ones. Among them were Pumapatak ang Ulan, Mahirap Magmahal ng Siyota ng Iba, Yakap sa Dilim, When I Met You and a few more. We only sang one song that was not familiar to them. It was the song Giliw, which we recorded late in our career. It is only available in CDs sold during APO’s live performances. It was never released under any record company. It is always a challenge to do an unknown song. I was so surprised when people started to applaud within the first 30 seconds of the song. Usually, material heard for the first time does not elicit much of a reaction other than a quiet appreciation and polite applause when it ends. At other times, people can even be oblivious to it, often talking while an artist is singing new unheard songs. This kind of boorish reaction shows that the song is not connecting to or engaging its audience. Thank God, they liked Giliw. Sometimes, I marvel at how songs can move people in different ways. The song Batang-bata can make some people cry because they remember their parents singing the song to them. Or maybe it is because they sang it to their own children. Or maybe there are other reasons. Hit songs are powerful, magical creations. They can bring you back to times and places and make you relive events long gone. They are the soundtrack of emotions and memories that you can play again and again. If the performers are good, they can get inside an audience’s head and heart through songs and make them feel warm and wonderful. They can transport you to happy memorable places without you having to leave your theater seat. As performers, I would like to think we still have some years to go before we seriously have to hang our coats and retire. In truth, I can only even speak of retirement theoretically. I can’t imagine ever retiring. Why should a person stop doing what makes him happy and fulfilled? It sounds nonsensical. Granted that we continue to have good health, we want to do this as long as we can. I will probably conk out with my boots on, so to speak. But before that happens, there are more shows to do, songs to sing and audiences to be entertained. Catch us when you can. I started this Blog in 2003. I have been at it for 15 years now. My clicks have actually surpassed 2M but since I have changed hosts 3 times, I have lost actual count. And now under my new host, my visits are below 300,000. Don’t ask me how that happened. It was probably caused by techno-clumsiness. I reviewed some of my entries randomly and I actually found some of them interesting. I can’t even remember how I wrote some of them. Feel free to jump in and wade through the archives. And comment freely. This blog will go on very active mode very soon. I was a daydreamer as a young boy. I could be in a classroom or anywhere and whenever anything caught my fancy, I would imagine myself in made-up situations and scenarios. An open window in a classroom with a view of green space would make me feel I was running around carefree or riding a horse at great speed. Seeing a fire truck pass by while looking out the window of a car, I would become a fireman riding on it. Being a fireman — someone who knew how to deal with dangerous situations like houses on fire — was one of my ambitions then. I would imagine extinguishing blazes and rescuing people. Sometimes, while walking in school I would be in a daze because I would imagine seeing the animals and wildlife roaming the campus before it was built. I remember being in second grade, walking along the corridors of the Ateneo, imagining what the area was like before the mortar, brick and cement structures came into being. Was this a wild forest once? Were there lots of tall trees with vines? I imagined swinging from one tree to another. I still daydream to this day. The only difference is I do not get so lost that I have to be called back to reality. I love playtime. The habit of allowing my imagination to run where it wants to go is something I still regularly engage in. I am glad I have not lost that habit. I like turning things around, upside down, right side up in my head. I like mixing letters to find other words and placing commas and periods in sentences to create new meanings. I enjoy matching things that don’t naturally go together; making scenarios in which random things that were never before connected suddenly fit or co-exist in a new order. I like puns a lot. On certain days, I try to find humor or irony in everything. I imagine the kind of lives strangers live with the little info I know about them. Daydreaming is creative pursuit. Essentially, it is making something out of nothing. As an exercise, I can be having dinner in a restaurant and I try to imagine who cooked the fish I am eating. And I can go deeper and ask whom the supplier was who brought it to this resto and who the fisherman was who caught it. What were they like? Do they have families? Where was the fish caught? All this can be going through my mind while I am eating. And I know I am just scratching the surface here. It makes dinner a more engaging experience. In a creative class that I run, I ask my students to come up with a list of imaginary lives they would have wanted to live but cannot due to age, gender, race or any other circumstances. The list of imaginary lives usually includes astronaut, princess, king, spy, rock star, very rich people, superhero, etc. I then ask them the reasons why they wanted to be those people. Most people who choose “astronaut” say it is because they wish to travel to space and explore new worlds. I then ask them to think of an activity they could do now that would give them a chance to literally explore a world unknown to them. Many mention scuba diving. The idea is to get the essence of what it is you fancy and look for a similar but doable experience that can give you the thrill you are looking for. Basically, you look for its substitute or parallel. It is a very empowering exercise. Many of my students end up pursuing new hobbies that make them feel more alive. This is one of my favorite modules in the workshop. It forces people to escape from literalism, from the cut-and-dried packaged experiences that the world offers. It makes them imagine and explore wildly. In the process, they get to know themselves more and come up with creatively doable alternatives. At 67, I still imagine lives I want to live. I still wish to be an explorer, a world teacher, an author of at least 10 books, a hiker, a cook, a philanthropist, an ambassador, an influence for good — among other things. I am at present engaged in some activities that make me feel and experience the essence of my ambitions above. An explorer likes to venture into unknown territory. I fulfill that impulse by going to destinations unknown to me, going native, eating different types of food and immersing myself in the culture of the place. I may not traverse big mountains or wild forests but I have the same mindset of one who does all those things. Come to think of it, this also parallels some of the things that an ambassador or a hiker would be doing. When I say yes to invitations to talk to varied groups of people, I get a kick — even if on a smaller scale — similar to what a world teacher must experience. I get out of my small world and share myself with new pockets of humanity. I touch people in ways that give both my audience and I something to learn from. I still have to do more about my wish to become a cook. I have to go beyond just cooking adobo and other easy dishes. It is not enough to simply know how to fry things. With ambitions like these, you can’t live it in your head. You literally have to do work. A philanthropist wants to help people by giving money to help others live better lives. Someone who wants to be a force of good in the world can actually be doing the same thing. I often give a chunk of my time and attention to those who are in need. I have sent random kids to school. I try and lend an ear to strangers I encounter when I feel they need someone to talk to at that moment. I have initiated dialogues with strangers whom I sense really needed someone to talk to but are too lost in their pain. I may have prevented two possible suicides by doing this. I may be doing philanthropic work in a very small scale right now but I feel I am on the right track. Someday, who knows, I may suddenly come across a large fortune. I will be ready to help in a bigger scale when it happens.